I have short reads and long reads. 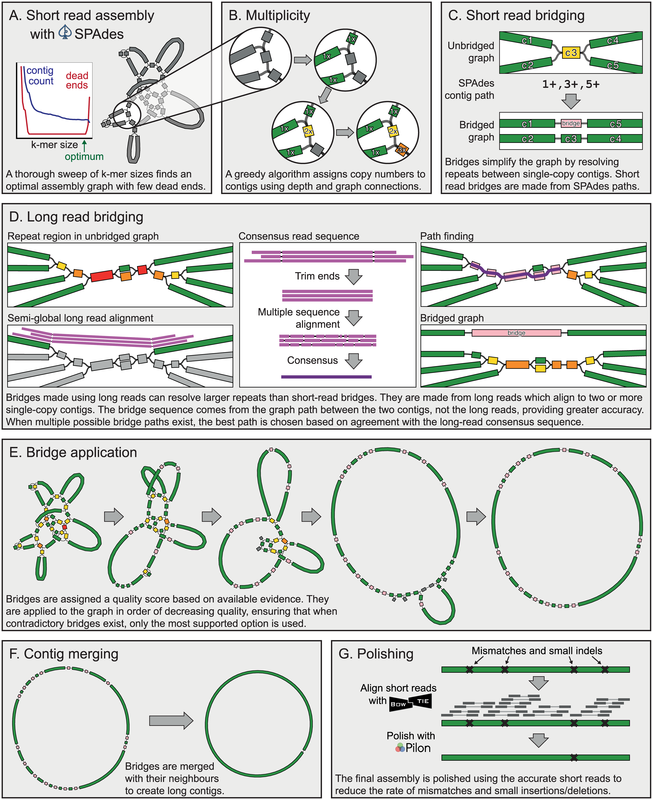 How do I assemble a genome? In this tutorial we assemble and annotate the genome of E. coli strain C-1. This strain is routinely used in experimental evolution studies involving bacteriophages. For instance, now classic works by Holly Wichman and Jim Bull (Bull et al. 1997, Bull & Wichman 1998, Wichman et al. 1999) have been performed using this strain and bacteriophage phiX174. To sequence the genome we have obtained the strain from the Yale E. coli Stock Center. The stock center sent us a filter paper disk infused with cells. The disk was placed in the center of an LB-agar plate. A single colony was picked and resuspended in a liquid LB medium, grown overnight, and genomic DNA was isolated. The DNA was then sequenced using two methods. To obtain high coverage, high accuracy data we used Illumina miSEQ to generated 250-bp paired end reads. To generate high length reads we used the Oxford Nanopore MinION machine. Our goal is to reconstruct and annotate the full genome of E. coli C-1. As you will see in this tutorial a combination of many short, high accuracy reads with long, error-prone reads helps us produce an almost perfect assembly. In this tutorial we will assemble a genome using two types of input data: (1) Illumina 250 bp paired-end reads and (2) Oxford Nanopore reads. We generated 9,345,897 250 bp read pairs (library preparation performed on genomic DNA fragmented to mean size of 600 bp). However, to make sure that you can complete this tutorial in a finite amount of time we have downsampled (reduced in size) to 1,000,000 paired end reads - just enough to produce an accurate assembly. Figure 1: Distribution of nanopore read lengths. 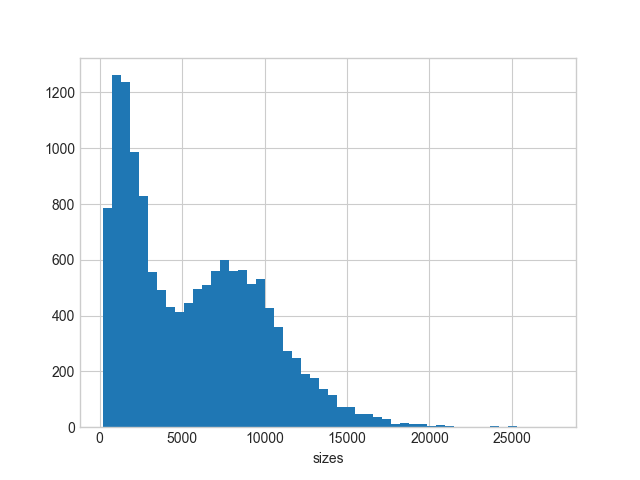 You can see that there many reads under the second peak with median of approximately 7.5 kb. Oxford Nanopore machines output data in fast5 format that contains additional information besides sequence data. In this tutorial we assume that this data is already converted into fastq. An additional tutorial dedicated to handling fast5 datasets will be developed shortly. In this analysis we will perform two tasks: (1) assembly and (2) annotation. Below we will briefly outline the main ideas behind these two procedures and will describe the tools we will be using. Here we assume that you know a thing or two about assembly process. If you don’t: look at the slides accompanying this tutorial as well as other tutorials is this section. Figure 2: Simplified view of the Unicycler assembly process (From Wick:2017). In short, Unicycler uses SPAdes (see below) to produce an assembly graph, which is then bridged (simplified) using long reads to produce the longest possible set of contigs. These are then polished by aligning the original short reads against contigs and feeding these alignments to Pilon - an assembly improvement tool. As you can see Unicycler relies heavily on SPAdes and Pilon. We will briefly describe these two tools. While the use of paired reads and mate pairs is key to genome assembly, and not new, SPAdes utilizes so called paired DeBruin graphs to take the advantage of the paired end data. 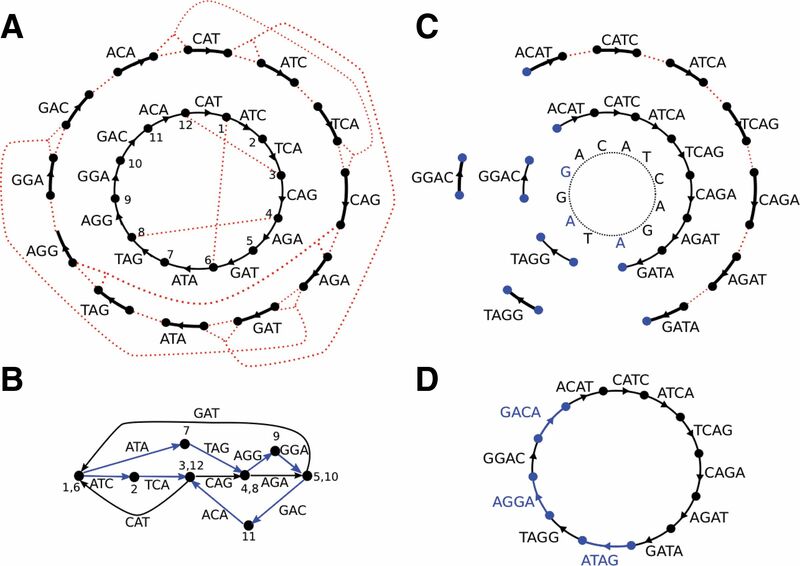 One of the key issues with paired DeBruin graphs is that the resulting genome assemblies do not tolerate variability in insert sizes: The initial formulation of paired DeBruijn graphs assumed constant distance between pairs of reads. In practice this distance is always variable. SPAdes performs k-bimer (these are k-mers derived from paired reads) adjustment to identify exact or nearly-exact distances for each k-bimer pair. SPAdes (or rather BayesHammer) counts k-mers in reads and computes k-mer statistics that take into account base quality values. A Hamming graph is constructed in which k-mers are nodes. In this graph edges connect nodes (k-mers) if they differ from each other by a number of nucleotides up to a certain threshold (the Hamming distance). The graph is central to the error correction algorithm. Then Bayesian subclustering is done on the graph from the previous step. For each k-mer we now know the center of its subcluster. Solid k-mers are derived from cluster centers and are assumed to be error free. Solid k-mers are mapped back to the reads. In the case of the full dataset, SPAdes error correction changed 14,013,757 bases in 3,382,337 reads - a substantial fraction of the full ~18 million read dataset. 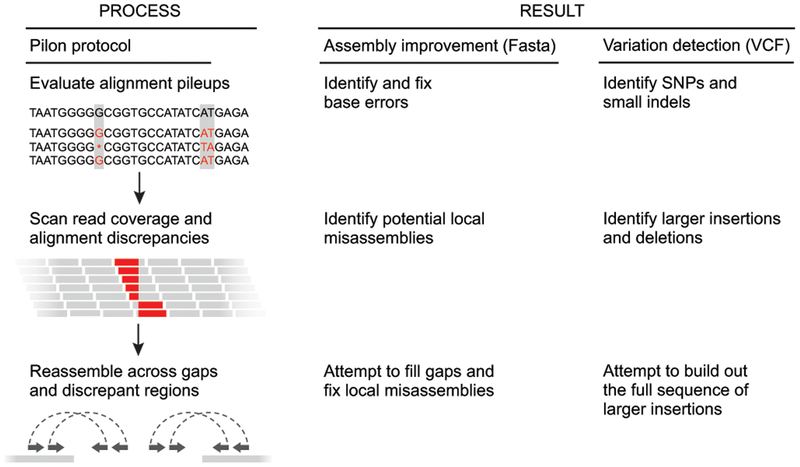 Prokka predicts protein-coding regions using a two step process. It first identifies coordinates of putative genes using Prodigal and then compares the gene sequence against databases of known sequences at protein level using Blast+ and HMMer. In this example we will use a downsampled version of E. coli C-1 Illumina and ONT sequencing data. These include 3 files: forward and reverse reads for Illumina, and Long read file produced by ONT. All data are in fastq format. Create new history (if you are new to Galaxy see Galaxy 101 tutorial first). Figure 8: Uploading data into Galaxy. First (1) click Paste/Fetch data link. Next (2), paste URL copied from Zenodo. Finally (3), set type of all datasets to fastqsanger. Click Start (4). If all goes well you will see datasets uploading and changing states from gray to green as shown below. The figure below also shows how datasets can be tagged. Figure 9: Sequencing data loaded into Galaxy history. The full progression from gray (scheduling) to green (all OK) state is shown. To make it easier to identify datasets as we progress through the analysis we use so-called Hashtags. To tag a dataset: click on dataset to expand it (as shown in panel four); click the tag icon () and a text field will appear. Add a tag (in this case F) pre-pended with hash (#). Hit enter. Do this for all three datasets and it will appear as in panel five. 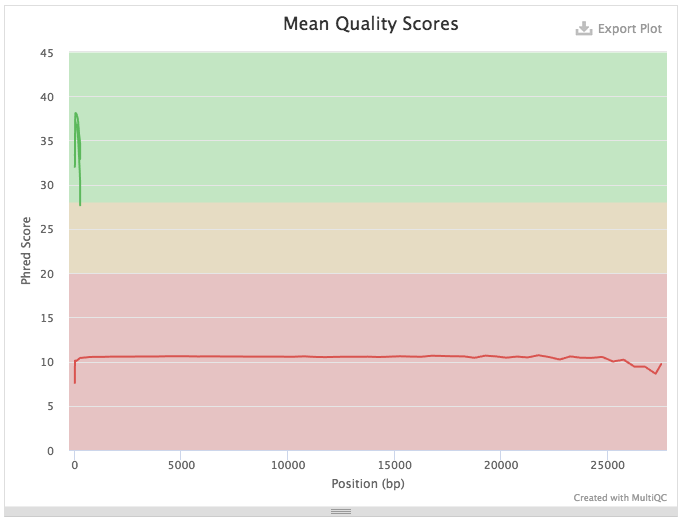 To assess quality we will use two tools: FastQC to generate quality statistics and multiQC to summarize these statistics. Figure 11: Zooming in shows quality distribution for Illumina reads. This is excellent data with mean base qualities above 30 across all reads. Now it is time to perform assembly. There is no such thing as Assembly in real time. It takes time so it is a good time to have lunch or at least coffee. This Unicycler run will take anywhere between 90 minutes and two hours. 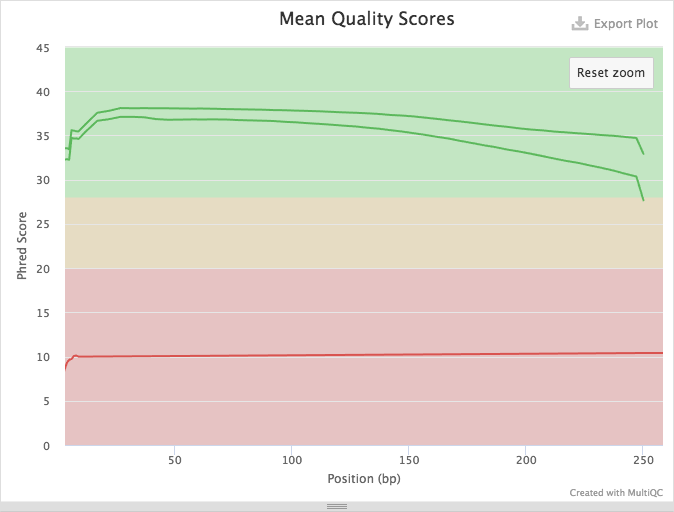 Quast is a tool providing quality metrics for assemblies, and can also be used to compare multiple assemblies. The tool can also take an optional reference file as input, and will provide complementary metrics. “Contigs/scaffolds output file”: Select the fasta file resulting from the Unicycler assembly. 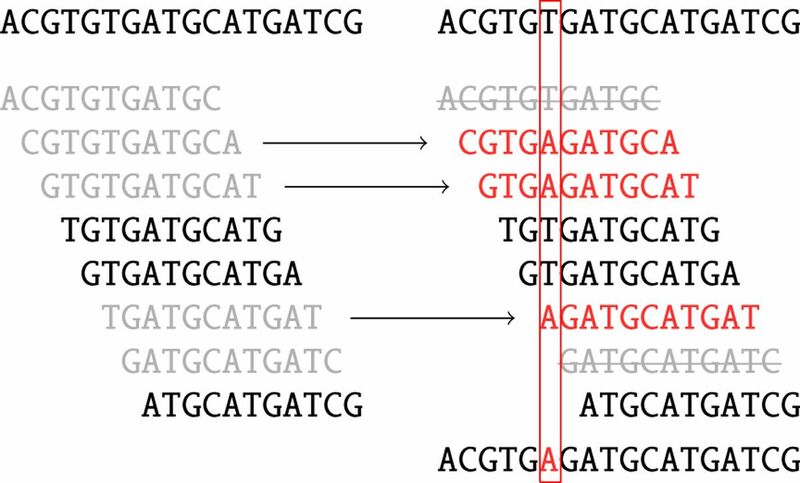 Figure 12: Quast Output: Quast provides different statistics such as the number of contigs or scaffolds, the N50 and N75, and the total length of the assembly. 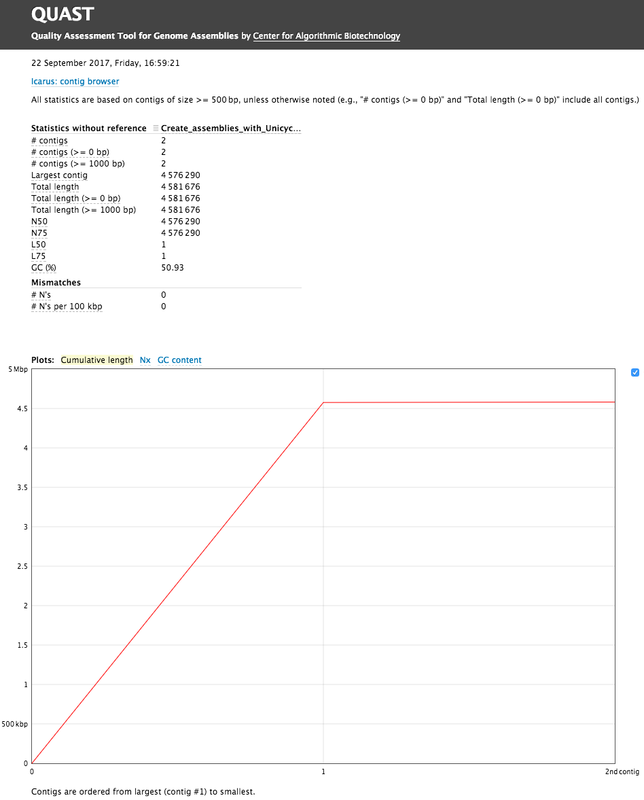 You can also access 3 plots, the cumulative length of the contigs, the Nx, or the GC content. One can see that there are two (!) contigs. The largest contig is 4,576,290 bp (for comparison E. coli K12 MG1655 strain genome length is 4,656,144 bp) and the smallest is 4,581,676 (total length) - 4,576,290 (length of the largest) = 5,386 bp. When we analyzed this dataset for the first time we were initially puzzled by this second contig. But we quickly realized that this is simply the genome of bacteriophage phiX174 which is routinely used as a spike-in in Illumina sequencing. Thus we have two genomes: the one of E.coli C-1 and phiX174! We can now use Prokka to annotate our two genomes. txt : Provides Statistics on the annotation : number of CDS predicted, number of rRNA etc. tbl : Provides a tabulated list of annotated features. 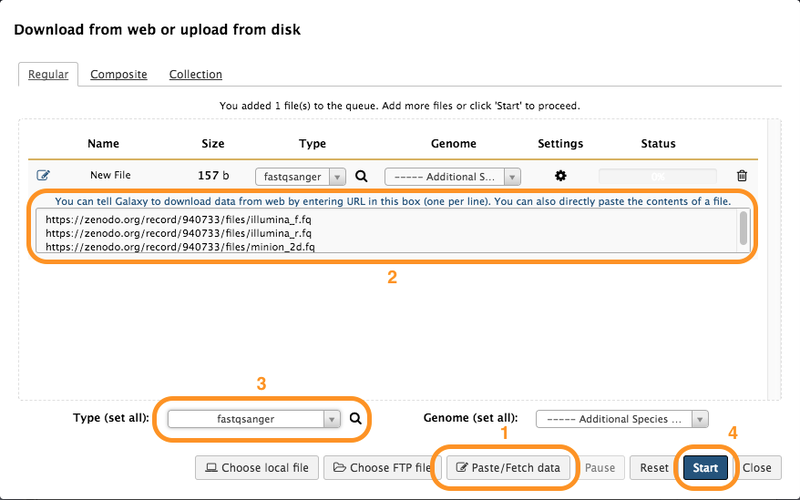 fsa : Nucleotide fasta file of the input contig sequence. sqn : ASN.1 format file for submission to GenBank. ffn : Nucleotide FASTA file of all the prediction transcripts. faa : Protein FASTA file of the translated CDS sequences. 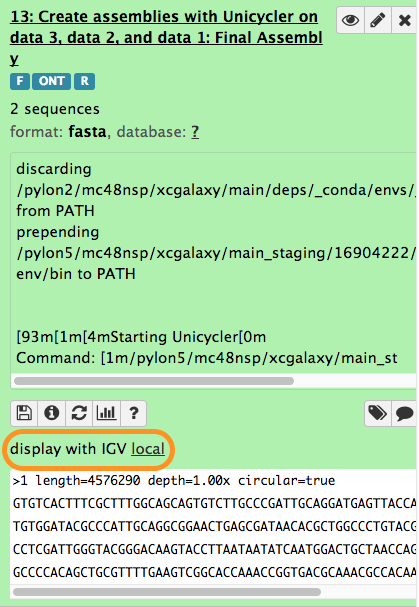 fna : Nucleotide fasta file of the input contig sequence. 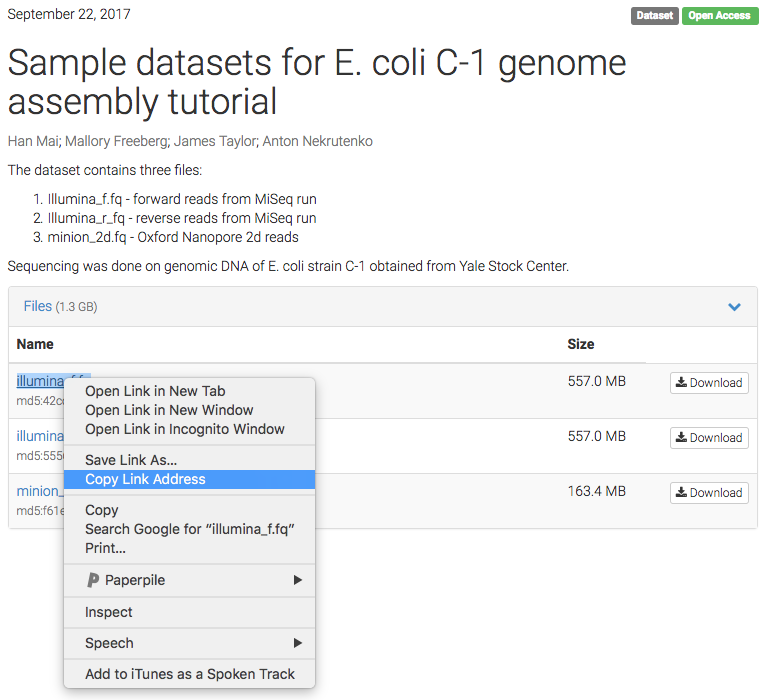 Let’s look at the entire assembly and its annotation in the genome browser. We can do this using Integrated Genome Browser (IGV). 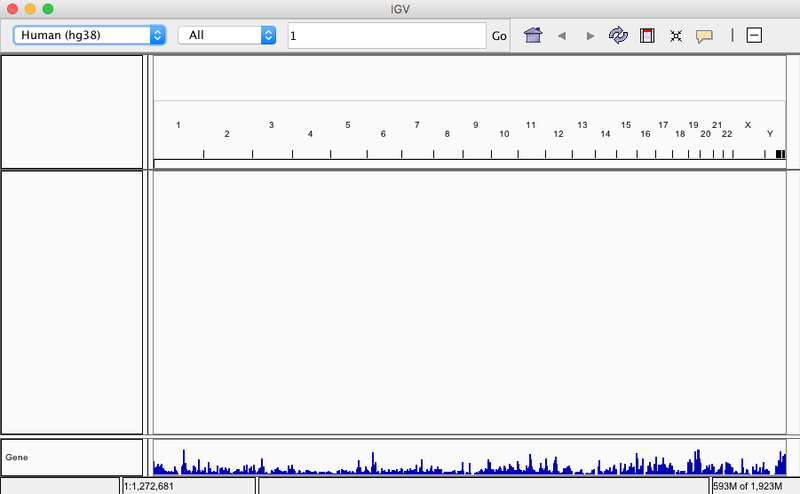 Visualization requires a local installation of IGV. If you have IGV installed - just start it. If you don’t - read on. Go to IGV download page and select one of the options. The one I would try first would be Java Web Start. Simply click the Launch button for 10 GB distribution. 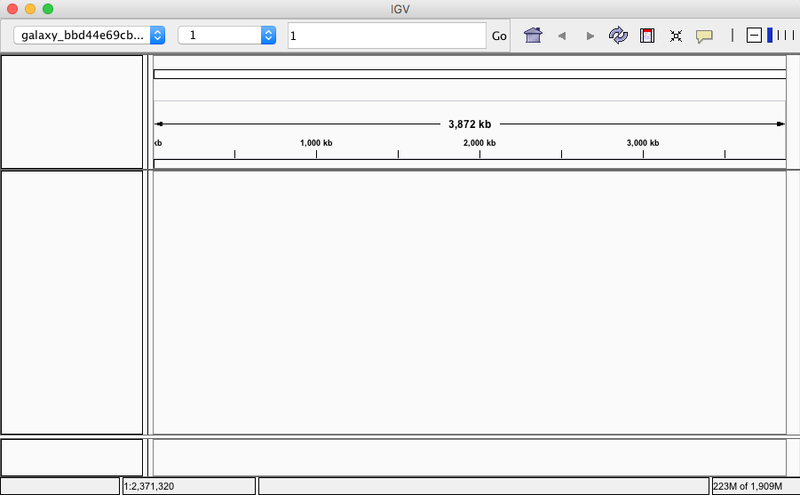 Figure 13: IGV started by using Java Web Start. Note that it is currently showing Human Genome (hg38) build. This is obviously not what we want. Figure 14: Expanding Unicycler assembly reveals IGV link. Figure 15: Now you can see the major contig shown in the browser window. Figure 16: Expanded GFF dataset generated with Prokka. 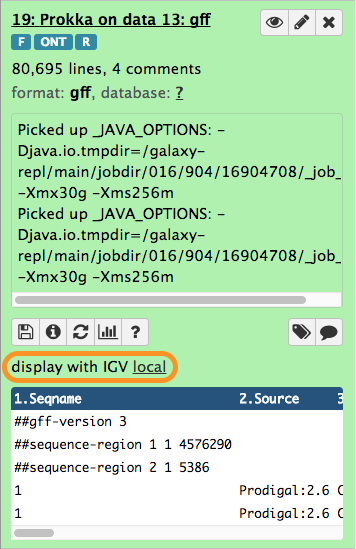 Click on the local link (highlighted with orange outline) to display this dataset within IGV. 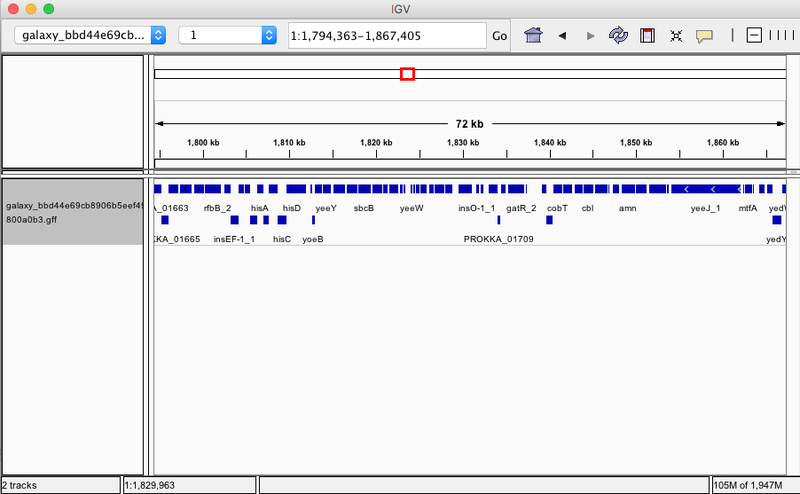 Figure 17: Viewing annotated assembly withing IGV. This material is the result of a collaborative work. Thanks to the Galaxy Training Network and all the contributors ( Anton Nekrutenko, Delphine Lariviere, Simon Gladman)!